Safe Food Resources offers affordable on-line food safety training developed for front-line, entry-level employees. Each course is designed by food safety professionals who understand the impact each employee has on your food safety programs. Our courses are short, interactive and fun with knowledge checks at the end of each course. We offer bite size impactful pieces of information that keep the learner’s attention on the things that matter to them today in the food manufacturing environment. Upon completion of each course, a certificate is issued that can be printed for reference. As learners complete each course, they can contact an expert here at Safe Food Resources with questions they may have regarding their food safety training topic. This invaluable benefit is included in YOUR secure branded food safety training portal that can be accessed at any time, from any device! As an administrator, you will have access to reports, be able to assign courses to your learners and even monitor their progress as they go! Safe Food Resources web-based food safety training reduces the time it takes to schedule training, is cost-effective, and takes the paperwork out of training records. 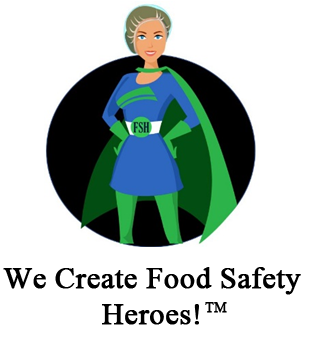 You are a Food Safety Hero! And now you want to increase your knowledge in food safety. That is great! Welcome to the Safe Food Resources Team. Your annual subscription includes access to all courses listed in our e-learning library and it continuously grows every month! You can make your purchase right here on line, just choose the language you prefer to use for your course and you are off and running with access to all of the features of our learning management system, like Ask the Expert and the Android or iPhone App! Click here if you are an existing member of this site. Don’t be afraid to learn more about our packages for your employees. They aren’t as expensive as you might think, and we can assure you, it is worth making that phone call to our office to learn more. We’ve structured our annual subscription pricing so that it is cost effective for small companies and large companies alike, in a budget that you will be able to afford. Your employees will be able to download the Android or iPhone app to complete their training or you can set up a training center right in your company like many of our clients do. They will also can Ask the Expert when they have a question about the training, right in the app or online. Free of Charge! Your branded learning portal is just the beginning. You can assign groups, assign courses, check progress and run reports for your Regulators and Auditors. But that’s not all, check out our features page to learn more. 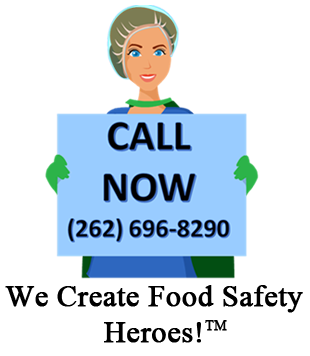 Let us help you turn your employees into food safety heroes and give us a call (262) 696-8290. We can talk pricing, demo’s, custom courses, or even the weather! What are you waiting for? (262) 696-8290.